There are so many things that you need to take into account while launching an official web page of your personal or business project. You need to get a clear understanding of the preferences of your target audience. Also, you need to think about the data that you would like to be present on your site. The structure and presentation of your content are extremely important, as well as the further promotion of our venture for better audience engagement. In a word, there are so many things to mind that a headache caused by site production issues is the last thing you want to deal with. Is there an alternative to this? Sure! Working with ready-made WordPress themes, you can focus on the presentation of your venture and its contextual filling. All the rest is already done for you. Launching a website in the modern-day world should cause you any troubles even if you lack design and programming skills. Thanks to the wide choice of WordPress themes, you can select a topic-specific web solution that matches your expectations perfectly. Thanks to the evolvement of modern-day technologies, modifying web pages code-free is a common thing that lets small to large-scale venture to have their official page on the web. Are you looking for the most popular web themes for 2018? I think that the following compilation will just come in handy to you. Jacqueline is a premium-quality WordPress theme that’s best suited to be used for spa salon, beauty company, wellness center, massage services agency or any other kind of beauty & healthcare-related business. The fully responsive layout of the theme comes loaded with all the essential tools and features that are needed for the effective promotion of your venture. There are a ready-made blog, newsletter, and advanced galleries being included in the theme’s pack. Owing to the built-in appointments booking functionality, your customers can make a quick reservation while they are on-the-go. Jacqueline WordPress theme is made to be fully compatible with the WooCommerce plugin. Recommended for you: 6 Great WordPress Theme Frameworks for Theme Developers for 2019. Gutentype WordPress theme is well-suited to be managed by users of all skill levels. The fully responsive layout of the theme is ready to become a solid foundation for blogs, news sites, media portals, live-streaming channels, etc. 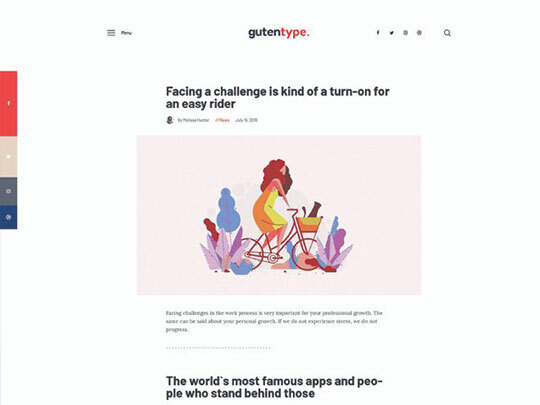 The theme includes the full Gutenberg support, including all Gutenberg blocks, extra theme shortcodes compatible with the page builder, and enhanced block styles. Additionally, the theme contains Instagram Feed, MailChimp for WP, WooCommerce, and Contact Form 7. As the name of the theme suggests, its intended to be used for the launch of any kind of a natural food-related website. 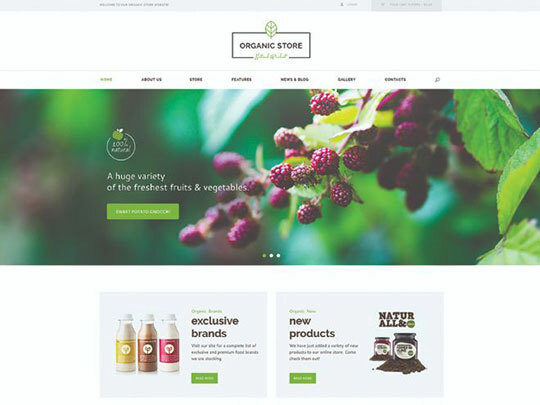 A clean and contemporary look of its pages will work well for bringing online dairy firm & cheese farm, winery and grape farm, and corporate eco products stores. There are ready-made homepage layouts available in the theme’s pack. The full WooCommerce store compatibility allows you to build a fully-fledged eCommerce project using this SEO-friendly WordPress theme. 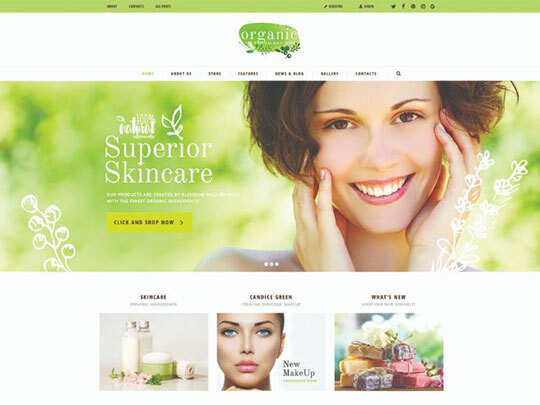 Here is one more stylish, fresh and clean WordPress theme that is apt for the launch of organic beauty stores. It’s also a great solution for getting started with healthcare and beauty blogs. The responsive theme’s layout looks stunning on absolutely every screen from which it’s being accessed. The theme stands out with an intuitive visual interface and easy-to-follow navigation patterns. It made to be compatible with a range of WordPress plugins, including WPBakery Page Builder. It provides for a seamless theme’s layout modification experience absolutely code-free. 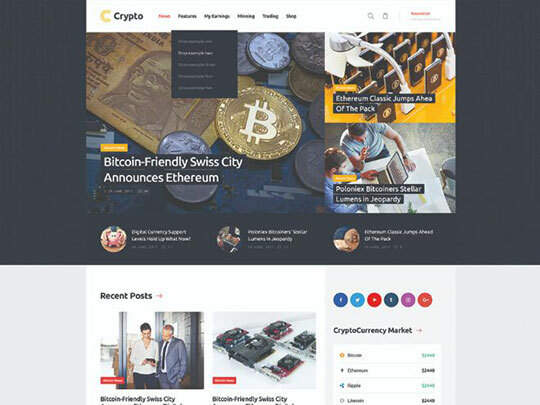 If you are looking for a ready-made WordPress theme for a cryptocurrency site, then Crypton is well-suited for this purpose. It contains ready-to-go cryptocurrencies pages and a bunch of crypto plugins that let you sell coins and accept donations online. For example, people can send donations to your site while simply scanning a QR-code. 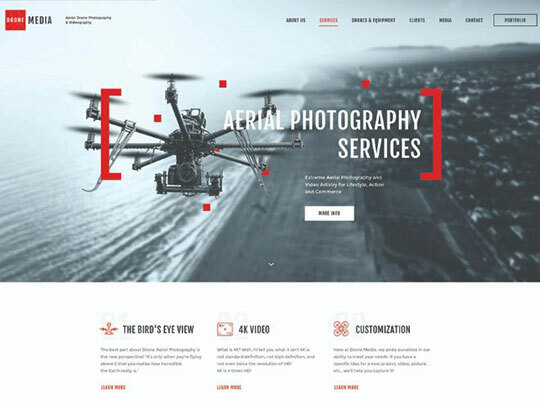 Drone Media WordPress theme is the ultimate solution for building content-rich photography and videography sites. The mobile-friendly layout supports a drag-and-drop page builder. There are multiple pre-made layout pages available. Using this theme, you can deliver a modern and trendy touch to your blog or portfolio site. Whenever you need to apply any sort of changes to the layout of your site, you can achieve this easily in the drag-and-drop interface. 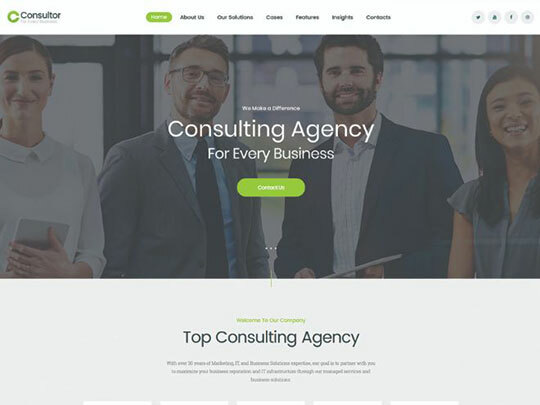 Consultor responsive WordPress theme is designed and developed to be used for the launch of consulting, law company, individual law, and financial advisor websites. The theme is equipped with a pack of business consulting WordPress plugins. There are sets of usable shortcodes and widgets that let you present any piece of data in a personalized style. Also, the theme includes premium WPBakery page builder that lets you build an unlimited number of custom layouts absolutely code-free. Pre-made gallery and blog post layouts come bundled in the theme’s pack. Using Alliance WordPress theme, you can feel the ease of launching usable yet professionally-looking sited for intranet and extranet services sites. 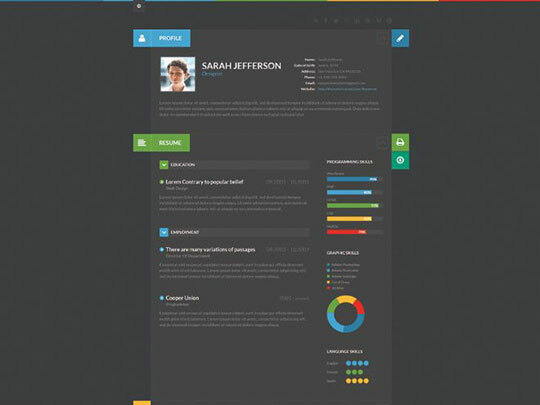 The theme features a usable and stylish layout that can add an unparalleled presentation to your venture. By means of usable dashboards that are added to this theme, you can create, edit and publish posts, calendars, corporate news, and graphs easily. The theme is fully integrated with BuddyPress plugin. The feature is especially useful for businesses looking forward to building communities around their brands. 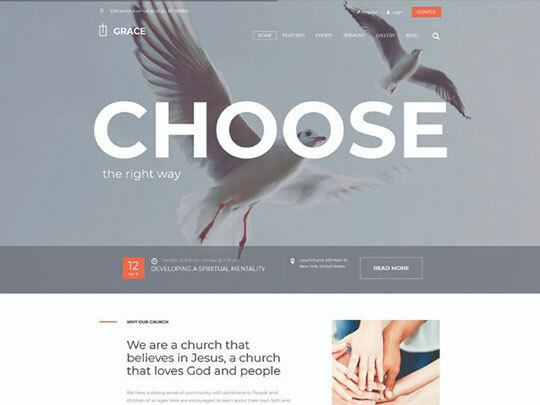 If you need to update a religious site with a brand-new look, then Grace WordPress theme is well-suited for this purpose. It works well for building Christian, charity, volunteering, believer community, God leadership academy, and a range of other non-profit organization websites. It delivers easy events management, stunning post and gallery layouts, and plenty of ready-to-use shortcodes that help you get the most out of this theme. It comes loaded with the popular Events Calendar, which is intended to keep your audience updated on all upcoming events. Additionally, the theme is integrated with ThemeREX donations plugins, which is especially useful for fundraising and charity purposes. Windsor WordPress theme lets you build a stylish and professional presentation of your real estate venture. 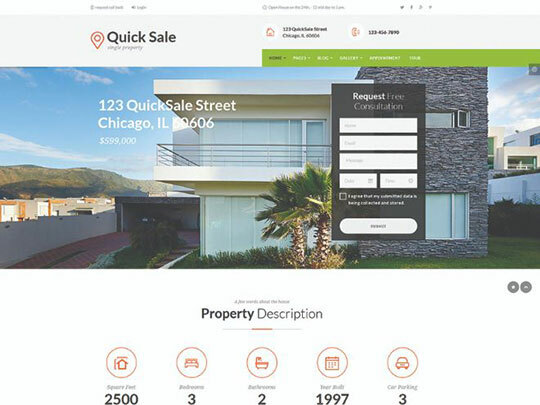 This is a fully responsive and modern-looking solution that is apt for brokerage agent services, rental business, residence realtor, residential & commercial developers, building company, and a range of other topic-specific purposes. The theme is made to be fully compatible with WPBakery Page Builder that delivers seamless code-free layout customization experience. Also, it supports a range of other popular WordPress plugins like WooCommerce, bbPress, and BuddyPress. Additionally, the theme comes loaded with the ThemeREX Add-ons plugin. You may like: 10 Premium WordPress Themes Great for News, Magazine & Editorial Sites. 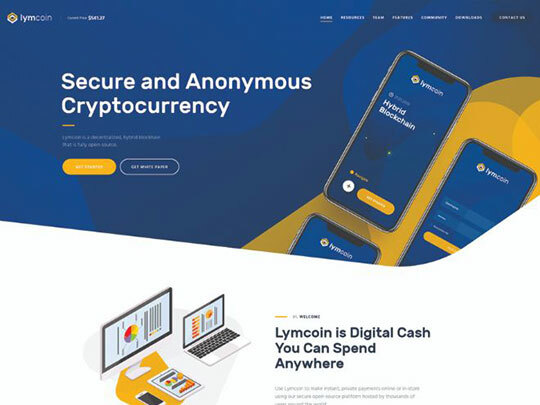 Lymcoin is a mobile-friendly WordPress theme that is ready to be used for a range of cryptocurrency sites. It contains multi-layout pages and the possibility to customize the theme’s structure code-free. Also, it supports Revolution Slider, Booked Appointments, Essential Grid, MailChimp for WP, and Contact Form 7. The theme includes a set of plugins that are especially useful for the start of cryptocurrency sites. For example, a crypto plugin lets you sell your coin or accept donations in real money or popular cryptocurrencies. 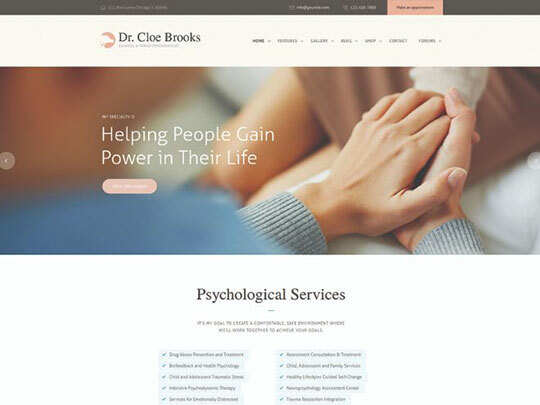 Cloe Brooks is a modern-looking WordPress theme that is intended to be used for the launch of consultation relationships, family, clinical, treatment, mental health, and other kinds of sites. The integration with an appointment’s management plugin makes it possible for web users to schedule meetings via a simple booking form. There is a free forum available in the theme’s pack. Make use of it to invite your audience to take part in discussions, thus improving your site’s rankings in search engines. ShiftCV WordPress theme is a contemporary pre-designed solution that is apt for building a creative, trendy, and functional layout that is perfectly suited for the launch of informative blogs, news portals, online magazines, and other kinds of content-rich sites. The fully editable layout of the theme is ready to be used for presenting copywriter services, developer organizations, designer portfolios, and other kinds of niche-specific ventures. There are 7 unique skins of one-page CV card and a personal blog available. The theme is built in regards to the modern-day GDPR guidelines. 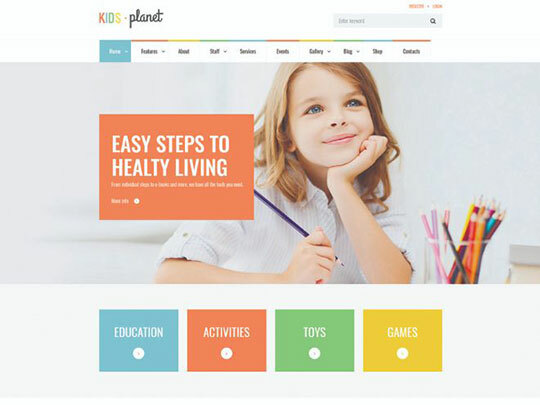 Kids Planet is a feature-rich and flexible WordPress theme that’s perfectly suited to become a foundation of childcare, kindergarten, children art, and preschool sites. It contains colorful blog and gallery layouts that allow you to update your site with a fresh and engaging look. The theme includes premade services and events management features. It’s accompanied with WPBakery Page Builder that allows you to create fully personalized layouts. 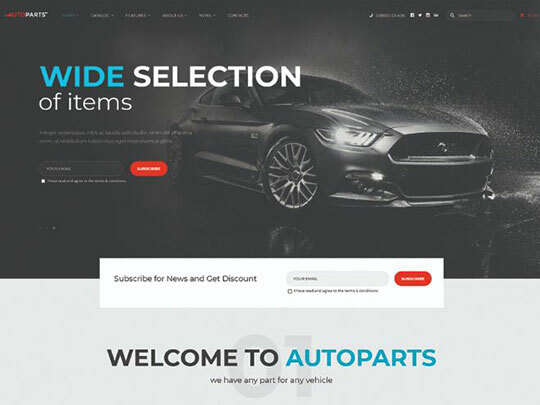 The theme is developed to be used for the launch of contemporary auto parts shops. Also, it’s well suited to be used for car repair, car audio, car accessories, and other kinds of sites that are related to vehicle maintenance and car sales. Downloading this contemporary theme, you get tons of pre-made pages, shortcodes, and widgets. The theme is made to be fully compatible with WPbakery Page Builder and Revolution Slider. The 100% responsive layout of the theme is Retina-ready, so you shouldn’t worry about the way your content will be displayed on the screens of last-generation devices. 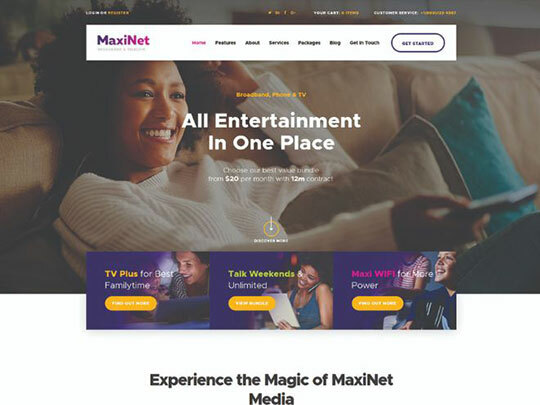 MaxiNet WordPress theme will be the best choice for getting started with a contemporary Internet company, Internet provider firm, and telecommunication bureau services websites. It’s integrated with powerful ThemeRex addons plugin that allows you to manage custom post types and social media profiles. The mobile-friendly layout of the theme is ready to be enhanced with a number of popular WordPress extensions, including WPBakery Page Builder, Gutenberg, GDPR Framework, WooCommerce store, Revolution Slider, and Essential grid. 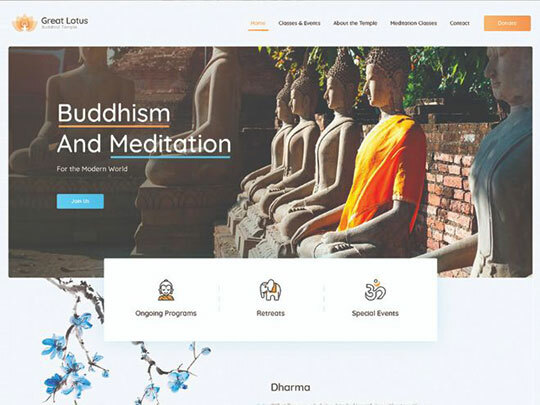 Great Lotus WordPress theme is a religion-based web solution that allows you to get started with a site of yoga, church, meditation, and spiritual practices. The theme contains a wide choice of features that are essential for meditation and spiritual practices websites. For example, the theme includes pre-made pages for history, mission, template, abbot, and meditation information. There are powerful donations plugins available as well. By means of classes and events options, you can welcome a wider audience to visit your religion-related project. 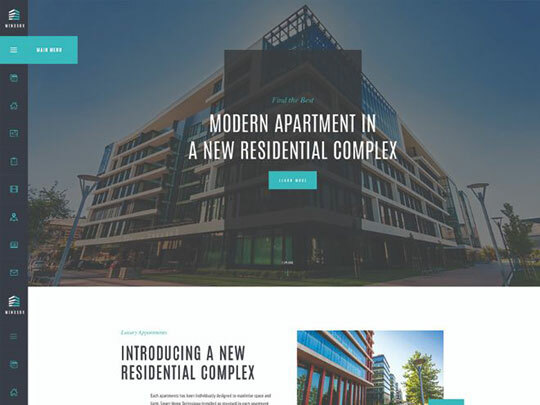 Take a closer look at this WordPress theme if you need to deliver a usable yet eye-catching presentation to your real estate company website. The theme comes loaded with a powerful options panel, color management system, and a bunch of shortcodes. 6 homepage layouts and multiple menu styles are bundled in the theme’s pack. 20+ gallery styles are well-suited for a more engaging showcase of property listings. 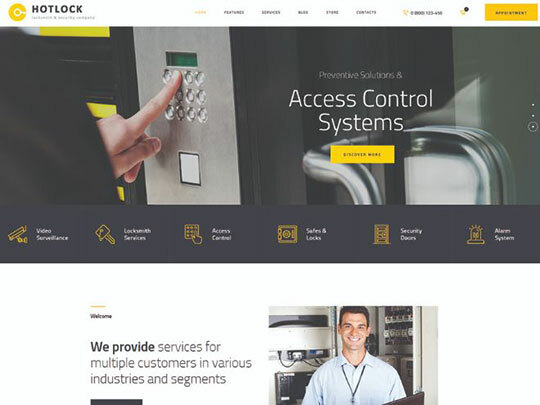 HotLock WordPress theme is well-suited to deliver a reliable and powerful presentation of security, locksmith services, guard firm, and online store company for locks and security systems. It’s fully compatible with WooCommerce. Thanks to WPBalery support, you will have no issues with the theme’s layout modification in the visual mode. A modern and trendy layout of the theme is made to be 100% responsive and Retina-ready. There are pre-made homepage layouts included in this theme. 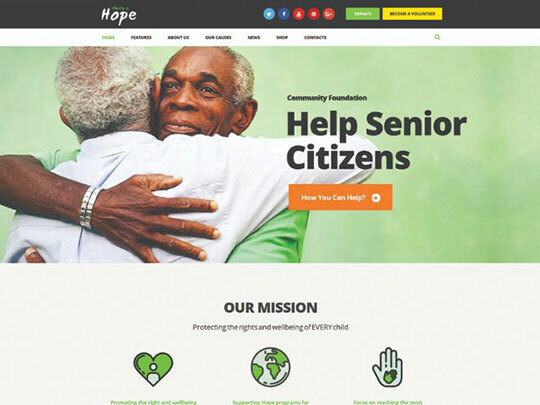 The modern look of its pages makes Hope the ideal fit for the launch of charity and non-profit sites. The fully responsive layout is SEO-friendly and cross-browser compatible. Retina-ready visual will look stunning on the screens of last-generation devices. 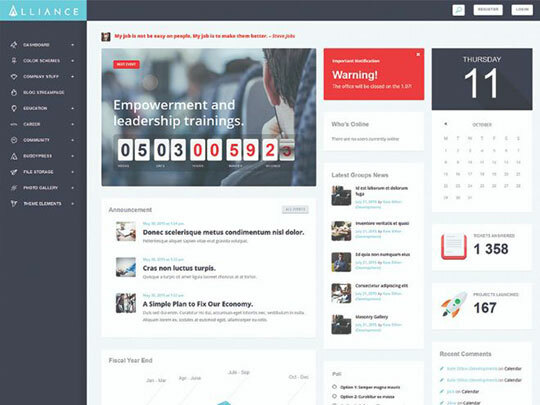 You may also like: 11 Facts About WordPress Theme That Will Make You Think Twice. 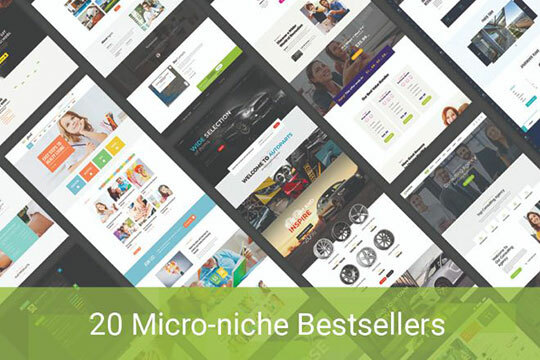 Use any of these best-selling WordPress themes to launch or update your micro-niche project. Being fully editable and feature-rich, they are ready to become functional foundations of any venture of yours. What are the major features that you value inside ready-made web designs? Did the functionality of the aforementioned themes meet your expectations? This article is written by Amy James. She is an Outreach & Marketing manager at ThemeRex and a true WordPress fan. She loves writing about WordPress, the latest web design trends and reviewing new WordPress themes.